Welcome to the March Dishing It Up Recipe Hop Giveaway! Dishing It Up is brought to you by Thrifty Texas Penny, Mama's Money Tree, Deals From Ms. Do, Saving Myself Silly, Dearly Domestic, 20 Something Saver, The Happy Lil' Homemaker, and Eating With MiMi. Over the last year, our hop has grown and we've implemented some changes to make it better for you. Earlier this year, we added a website and a Facebook page. This month, we are bringing you our first giveaway and hope it's just the first of many. Each month, we bring you recipes with a different theme and this month we're focusing on chicken. 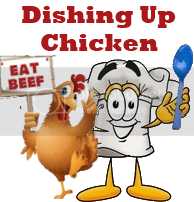 Chicken is a very versatile protein to cook with, so we're hoping to have a great variety of recipes linked up. There will be new recipes added each week, so be sure to keep up with us throughout the month and to linkup your own recipes as well. I would be remiss if I didn't share the absolute easiest way to cook a chicken - in a crock pot of course! We are so excited to be able to feature chicken from Zaycon Foods. One lucky winner will receive a Zaycon Foods account credit to be used on 40 pounds of chicken breasts. Mama Does It All had the chance to try the chicken from Zaycon Food and loved it. You can read what she had to say about it in her review here. Make sure you read on the Zycon site to find the closest drop off point to you.